No, she wasn't the only Scottish singer, but in my opinion she was the finest vocal interpreter of Scotland's traditional ballads, jigs, and reels, as well as music based on the poetry of Robert Burns. I learned yesterday of her death on August 21. In the video above, made in the 1960s when she was living in Greenwich Village with other young folk singers, she's sitting at a table with Pete Seeger and Roscoe Holcomb (with hat), and sings five songs. "The Beggar Laddie" is a lively ballad about a beggar wooing a pretty woman; it's one of many variations on this theme found throughout Britain and Ireland. "The Skye Fisher's Song" has a slow melody that evokes the landscapes and seascapes in and around the Isle of Skye; on the video it's accompanied by a montage of photos. "I Lost My Love" seems the title of a mournful ballad; actually it's a sprightly dance tune that ends in a port a beul, or Gaelic mouth music. "Miss McLeod's Reel," of which only a short portion is on the video, is another dance tune that's the source of the old-time American song "Hop High Ladies". Redpath does all these songs a capella; on her last number, Robert Burns' best known song, Auld Lang Syne, Holcomb and Seeger accompany her on guitar. 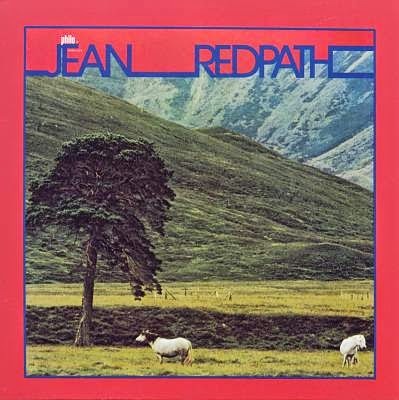 I had the good fortune to see Jean Redpath in performance at a small venue near Washington Square Park sometime in the late 1970s. There were only about twenty of us in the audience. It was a magical evening. It was almost exactly forty seven years ago today that I, newly arrived in Cambridge, Massachusetts for my first year of law school, was sitting with my newly made friend Tom McCoy in a little sandwich shop called Hazen's on one of the side streets near Harvard Square. I was biting into my roast beef on a bulkie roll (Boston's analogue to beef on weck, though not as good) when someone dropped a coin into the juke box and played "Brown Eyed Girl." Right then I knew it would be one of those songs, like "Believe Me" and "Uska Dara", that would be engraved on my memory. I didn't have to wait long to hear it again, though; it became a staple on WRKO, the Beantown top forty station to which I tuned my clock radio. Van and I have come a long way since that day in 1967. He's made lots of splendid music, some of which I've posted here. Photo by Jarvin via Wikimedia Commons.